Corporate Vintage was established in 1984 in Orinda, California from the ground up quickly gaining a widely recognition within the industry. In later years, the business was relocated to Pleasant Hill, California to the present. As we expanded in 2000, we became confident that constant development of artistry skills applied to our product would be appreciated by our corporate clients and well-known wineries. 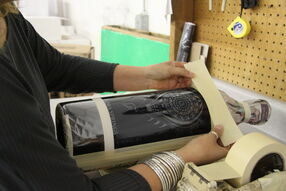 With each etched wine bottle, our goal is to create a special gift that makes a great impression that remains for years. They are hand-sandblasted and hand-painted with precision by our artisans to make sure that each piece will be enjoyed and treasured by your customers, employees and/or business partners, and friends. 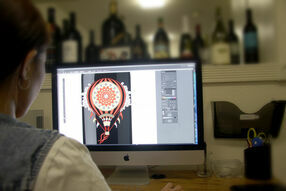 We begin by receiving artwork from our customers in Adobe Illustrator Vector art file. 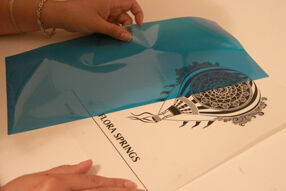 We then convert the art file to create the stencils that will be adhered to each bottle. 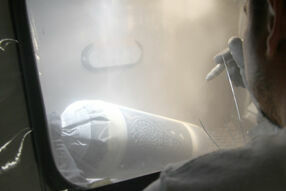 A well- trained operator sandblasts the bottles with accuracy and specifications by client expectations. 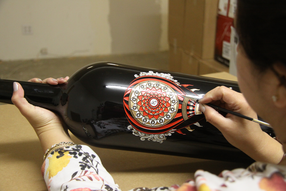 Lastly, we bring the artwork to life bycarefully hand painting each bottle using a variety of painting techniques that create a custom look.